These Stackable headers will work great with your Arduino Projects. 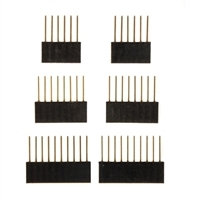 They are perfect for connecting Schmartboard shields as well as other manufacturer's Arduino devices to any type of Arduino main board. Schmartboard headers are always immersed in gold to assure the best connection and to avoid oxidation.